just shaking our heads. what an experience. Everything except baquettes (french bread) is expensive!! Dorothy Marie bought 2 6 packs of beer and 2 2litres of diet coke and guess how much American? yes of course $57.00 can you believe that!! we are all taking a calculator with us to figure out how much everything is in Cdn . and only buy what we absolutely need or is a decent price. internet is $27 for 3hrs and you have to buy 3hrs min. so we skipped that. so we have arrived to the Island Tahuata in Baie Vaitahu with all of our buddies - must be 15 boats here. lots of kids and we will be swimming tomorrow . nice sandy beach, clear water , can see the bottom and its 35 ft deep!! and now we are in paradise! check in at either Hiva Oa or Nuka Hiva, we haven't decided where yet. My preference would be where there is a place to do or have my laundry done. We have a lot to do!!! Thankfully the last couple of days have been slower winds and lighter seas......makes for a way easier ride. 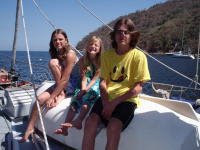 also look forward to washing off the boat , we are so covered in salt spray as is the inside. had just called us on the vhf to say they caught one ( first fish this trip) and then not 10 minutes later we had the same! have been able to stay this close together. we have traveled over 2000 nm with only 480 to go!! else is working excellently. love the autopilot, not a single problem, he just keeps on working. on the VHF. and as of this morning we are back in VHF range with the Dorothy Marie!! yeah!! head of the pack as the next two boats should be hitting port in a day or so. Trivia Question : what does ITCZ stand for? 26 = L. in the A. 12 = M. in a Y. A bit harder... 7 = W. of the W.
Hey all thought you'd like this. this is when we stopped at Socorro Island for the night. So glad I figured out how to send them. but it takes quite a while so only the odd picture will be sent. hey there all, as you have noticed i have figured out how to send photos through the ham. I have to adjust them so small, hope they look okay. It takes 25 minutes for one picture to go through so you will only get a few here and there. Enjoy!! notice how blue the water is!!!! we caught 2 tuna yesterday and one first thing this morning! yeah we needed them!! I ( Dionne ) am now the net controller for the 0200 time for the Pacific Puddle Jumpers net for the week. I call all the boats who are underway to the Marquesass and get their check in. there are 28 boats so far. Steve is working away polishing , and boy it looks great!! even has the girls helping out. Still battling the battery charging but Steve has a plan today to put the bigger alternator on the generator. this should help quite a bit. 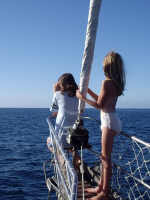 Check out our buddies blog at sailblogs.com/member/thedorothymarie this is the boat we are travelling with and she posted a picture of us on our boat iln the open ocean , have fun looking at us sailing along!! its getting hotter and hotter!! still sailing along here at 6 knots wing on wing - genoa on the port using the boom as a pole and the staysail on the starboard with the pole. works great!! have pictures to post later. Yesterday we had some big fish just tear out lure right off, kinda glad he did cause he must have been big. 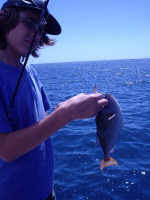 This was the lure that caught us that 6.5 foot marlin. made for some excitement. one once we hit the Marquesas) Check in with our buddies Robert and Rose of Tillicum at 1545 utc and then at 1600 uct its is check in with the Pacific Puddles Jumpers net on 6224 . throughout the day and evening we have been on the VHF with Dorothy Marie ( our travelling buddies) checking each others speed and position and course and anything else just for fun. Then we settle into our watch routine with the fist ones on, and the others sleeping and we switch every 4 hours. We keep a record of our position , course barometer wind speed, boat speed in our pilot log. check the radar, yack with Dorothy Marie, look out for other ships ( haven't seen any in about 5 days) then read, doze ( watch alarm goes of every 15 minutes) stare at the stars. I do miss going out for lunch or dinner once in a while. don't think I have cooked so much..... 3x a day 7 days a week ( so far thats 14 days straight) one of the first things we are doing when we hit land is going out to eat!!!! Steve and the kids do help once in a while with the food stuff. ps lat 11*51068'N 121*05.52'W - its warm at night and we are doing our watches in shorts and t-shirts ( steve no shirt) even in the middle of the night. how cool is that?! just a quick position update for the emails and blog. we are at 14*45'N 117*56'W doing 3.8 knots ( still waiting for the trades, should be here in the next couple of days) COG 205*T wind speed about 9 knots. Everyone is doing excellent, I am making french toast today - Emma says yeah!! I have been making chili to freeze and baking lots for when we have rougher weather. Still have Dorothy Marie right with us and we talk regularly on the VHF. well its is 1545 utc ( zulu, gmt whatever way youi want to call it - it's all the same) and time to check in with our other buddies on Tillicum and then 1600 utc is the puddle jumpers net check in. getting closer and closer to the equator! !